This may sound as though I’m making it up, but did you know it’s possible to spend a weekend far from Jakarta, up in the hills of the Sundanese countryside, without having to get in a car or languish for hours in bumper-to-bumper traffic? All that’s needed is a bit of planning. But first, let me tell you about the magical place, and then I’ll get on to the secret of how to get there. In the foothills of the dormant volcano Gunung Salak, and not far from the town of Sukabumi, is a small place called Cicurug. There, a few kilometres into the hills is a farm called Portibi. But Portibi isn’t just any old farm; it’s an organic farm, the fruition of a dream of a young Californian with a love for Indonesia. You may well ask: how did a bule from California end up on the side of a volcano in West Java? 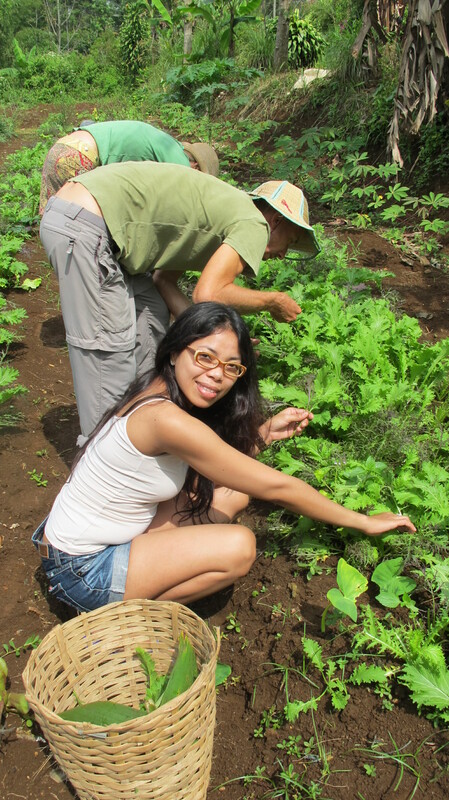 The farm is a joint venture between Jocean Bowler, from central California, and his original Indonesian host family. After arriving in Indonesia in the early 2000s, Jocean and his hosts decided to set up Portibi in 2004 on a clove farm that wasn’t being used to its full potential on 15 hectares of hillside. Putting aside his master’s thesis on land use in Indonesia, Jocean realized he had a more important mission. With an emphasis on living in harmony with the environment and taking no more away than is given back, Jocean set about building a farm that would preserve the flavours, endemic natural beauty, and local craftsmanship that Indonesia is in danger of losing in its rush towards modernity. He created a hideaway far from the city using inspiration from Sunda’s past, complimented with a few touches of modern technology to make it all work. Today, Lodges Ekologika at Portibi Farm is still a work in progress. Although the main living areas are complete, including a sumptuous dining room, large kitchen, a Pacifist Cannibal Lounge, only three hectares are currently cultivated. The farm has accommodation for up to 30 people in a dispersed collection of bungalows and cabins made with largely recycled timber from older buildings. 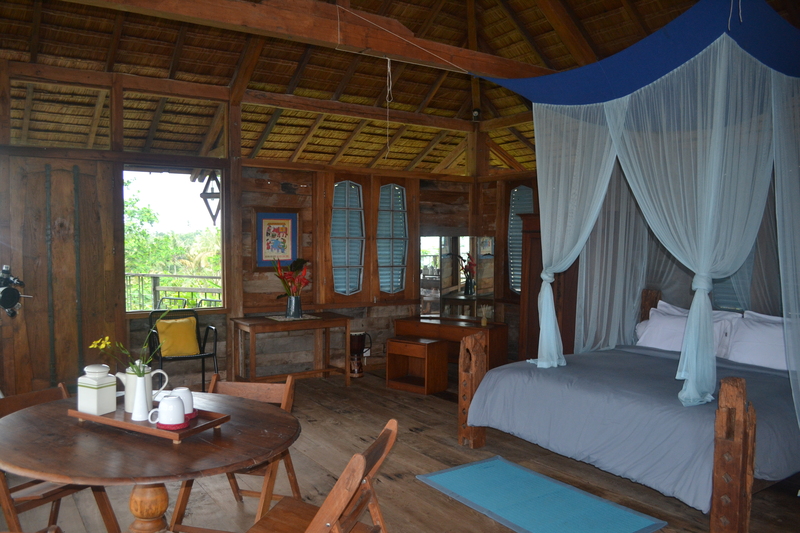 Some of the cabins are traditional Sundanese rice barns, taken apart and reassembled on the farm. All are lit by solar power; solar cells soak up the sun’s rays during the day, and then spill the light back through light bulbs at night. But nature has its limits: if you leave the lights on too long, they run out of juice. A well-stocked bar is conveniently located in the lounge, which is the place to hang out. It also contains a collection of board games, books, music largely from the 1970s and 80s, and a guitar for anyone with an urge to strum. Included in the price of a stay at Portibi are three wholesome meals a day, all of which strive to make good use of the farm’s organic produce. But never fear, Jocean still likes a good steak or fillet of fish. An excellent cook, Jocean and his well-trained team throw together the most delightful natural and tasty dishes using influences from around the world. And there’s an excellent wine list if you’d like to wash it down with something special, like a full-bodied Italian red. They may be organic pioneers, but they like to live well at Portibi. One of the must-dos while at Portibi is to go on a stroll around the property. Visit the workers and maybe learn about what they grow and lend them a hand planting, or collecting a basket of rocket leaves or parsley for the evening meal. You can also gather all the greens you can pick to take home. Don’t forget to take in the nature that surrounds you—the insects, the birds, the sounds, the smells. But beware of the caterpillars; beautiful creatures they may be, but they can leave you with the itchiest of rashes. You won’t be able to miss the butterflies here, which are striking and reason enough to visit Portibi; tropical varieties as large as your hand flit from plant to plant. If you’re really keen on the farming side of things, Portibi is also a member of the WWOOFing organization, which stands for Willing Workers Opportunities on Organic Farms. WWOOFers can spend three weeks or more on the farm with free accommodation and food if they contribute by doing a decent day’s work every day. If you feel a little more adventurous, there’s a great jungle trek up into the Halimun National Park that lies above on the slopes of Gunung Salak. The trek leads to the Citaman waterfall and rock pool where, if you fancy, you can jump in for a cool swim. 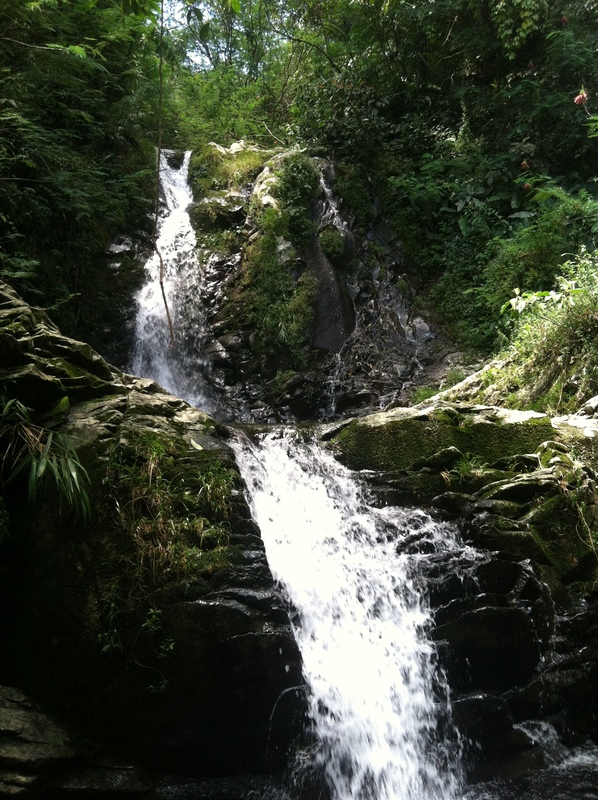 The trek takes 1.5 hours to the waterfall. If you are into more strenuous treks, or even expeditions to the summit of Gunung Salak (a good 5-hour climb), these can also be arranged with a little advanced planning. And now the secret bit. Believe it or not, Kereta Api Indonesia (KAI), the Indonesian railway company, has revitalized a track up into the hills from Bogor. The train goes to Sukabumi and then onwards all the way to Cianjur. It’s about one hour’s ride from Bogor to Cicurug, the nearest station to the farm and, if the weather is clear, can provide stunning views of the peaks of Gunung Salak and Gede. The three trains a day are in high demand, especially at the weekend, so it’s crucial to book online in advance. The train from Jakarta to Bogor is straightforward, but then you’ll have to walk about 400 metres from the main station to an adjacent smaller station from where the trains for Sukabumi leave. So, what are you waiting for now that the secret’s out? Go green in Portibi! Just call the farm on (0266) 257 7115, or email [email protected] to make a reservation, and then book the train, called the Pangrango, on KAI’s website, at www.tiketkai.com.